Calling All Worms This surprisingly simple technique will unearth some surprising results! Find an area of loose, slightly moist soil (the dirt under a log or landscape timber works well) and push a 12- to 18-inch-long stick two to three inches into the ground. 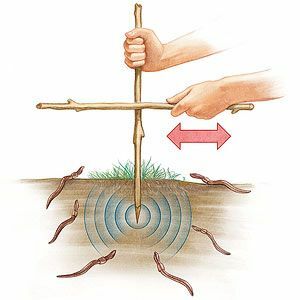 Vigorously rub another stick from side to side against it for about 2 minutes and watch as any worms in the vicinity wriggle to the surface. Try several areas in the yard to see which ones are the hottest worm hangouts.